Look from the sidewalk through the gallery’s ample window to see small yet complex, eventful, and colorful “sculptures” affixed to the walls; evenly spaced, they wrap around the gallery at eye level like a horizon line. 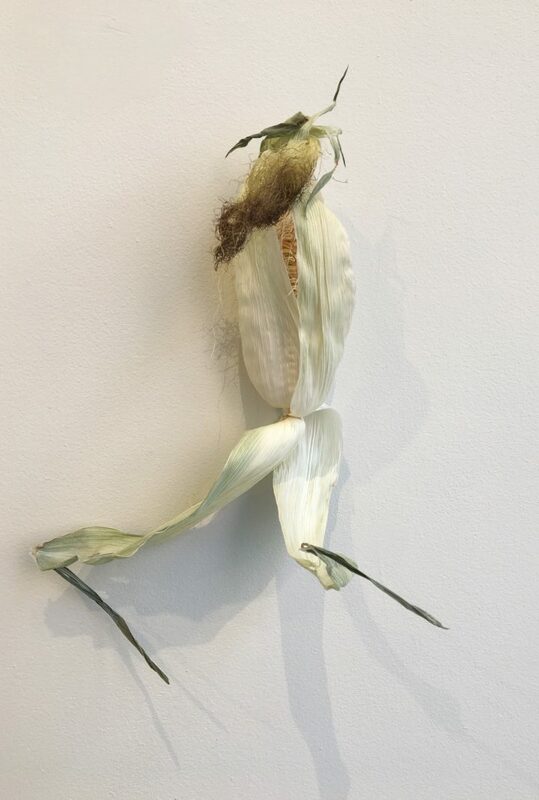 Each “sculpture” uncannily resembles a different fruit or vegetable, most of them quotidian: lettuce, an eggplant, a single brown mushroom, an ear of corn, broccoli, and a pear. Others are more exotic, like jicama, yellow dragon fruit, and black radish. Among other things, this exhibition is one of the most eccentric and unusual still lifes you will ever see. Instead of fruits and vegetables arranged on a table and rendered impeccably in a painting, actual objects are dispersed around the galleries walls, much as paintings would be. Enter the gallery and turn right to observe closely a plump head of purple cabbage. Turn around to see a bunch of green lettuce, with all its voluptuous surfaces and recesses. Look across the room to see a single red strawberry. It glows like a tiny beacon, as does a single red pepper. Colors abound and correspondences develop. That small strawberry over there, across the room, seems in dialogue with the magenta dragon fruit over here. The spiky pineapple and fennel on that wall relate to the eggplant on this one. The red pepper has much the same curving shape as a banana several items away. The orange splotch at the bottom of an acorn squash responds to a neighboring navel orange. During my first visit I eavesdropped on viewers who were trying to decipher what they were seeing, trying to figure out how Sander made these ultra-realistic sculptures. Guesses included ceramic, plastic, glass, wood, and paint. 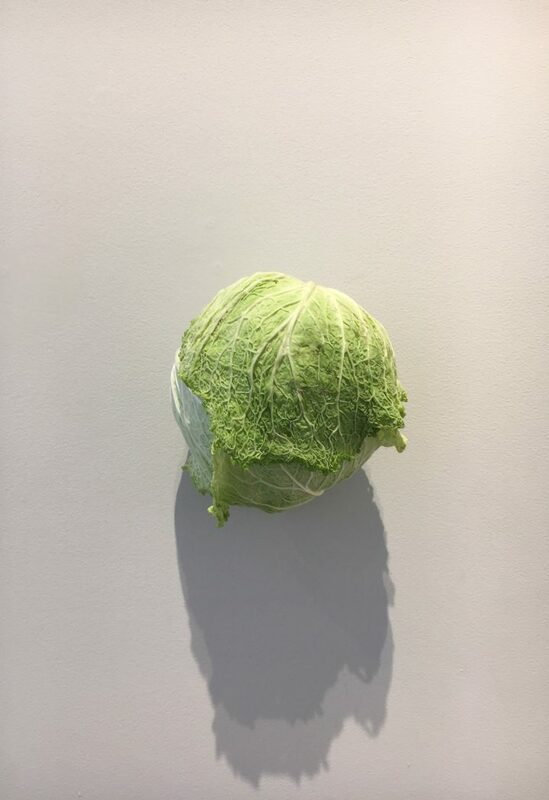 The gallery’s matter-of-fact checklist tells the truth: The lettuce sculpture is titled “Lettuce” (2012/2018) and the materials are listed as lettuce, stainless steel nail. The red cabbage sculpture is titled “Red Cabbage (2012/2018) and its materials are red cabbage and another stainless steel nail. But even then, many viewers remain doubtful and confused. 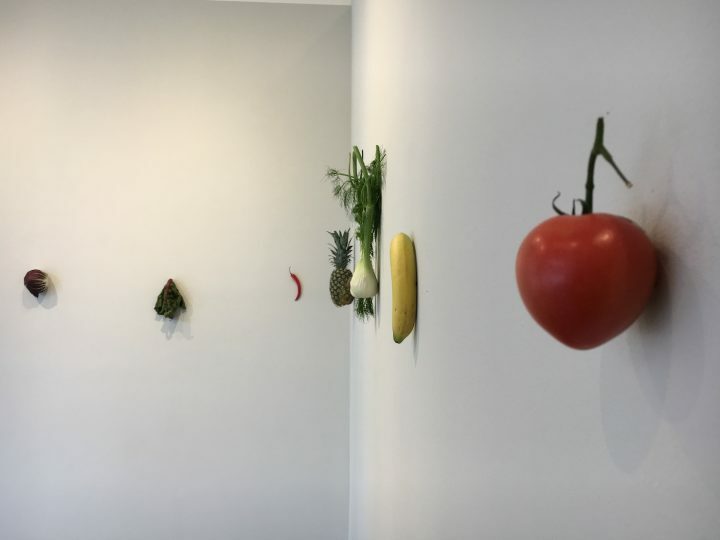 In fact, Sander did not sculpt these fruits and vegetables at all, at least in any conventional sense. Instead, they are for real: an actual orange, an honest to goodness beet, an authentic stalk of lemongrass. Rather than spending hours and weeks in her studio sculpting intricate forms from sundry materials, Sander essentially went shopping and brought her wares back to the gallery. Each item is hung on the wall on a specially crafted nail. Collectors don’t buy the actual fruit, but instead the idea of the fruit. They receive a handsome custom box, a signed certificate, and a nail. It’s up to them to install the fruit or vegetable on their wall, replacing it when it rots. It’s amazing how odd and compelling — even magical — these foodstuffs appear, displayed in this way, fairly high up on the wall, which in part has to do with a decisive shift in perspective. You often look down at these things, in supermarket bins, in the vegetable drawer of your refrigerator, or on kitchen counters. Sander has elevated them, literally, but also figuratively; they are no longer commonplace but exalted, not things to be summarily consumed but studied and admired. From some perspectives they seem to be floating or levitating; this adds to the magical aspect. These mostly average, easy-to-ignore things become exceptionally enticing, with a strange, magnetic pull, even something as unassuming as a lumpy cauliflower. You look freshly at each piece — a bunch of green grapes, a yellow banana, a single red tomato — with wonder and surprise, recognizing that these are complex and marvelous sculptural forms, just not ones crafted by the artist but instead made by the world. This does not mean that Sander’s hand, or better said, her thinking, is absent, because both permeate the exhibition. She chose these particular fruits and vegetables, for their shapes, colors, and variety, and installed them in a very particular way. Sander is often called a conceptual artist. That may well be the case in that ideas are fundamental for her, but if so she is a conceptual artist who realizes her ideas sensually and concretely, with a great deal of visual vitality. There is enormous visual pleasure and seduction in this shifting and fluctuating horizon line of fruits and vegetables, some smaller and others bigger, some rough and others smooth, some brilliantly colored and others much more subdued. You find yourself paying attention, perhaps as you never have before, to details, to the rhythmic ridges of an acorn squash, the bumpy peel of an orange, the several colors (red, soft yellow, light green) of a mango, the spiky surface (tinged with green) of a yellow dragon fruit. It is of course comical and somewhat absurd to gaze raptly at a pineapple or a single stalk of asparagus, much as you would at a painting or sculpture, and also considerably challenging. Lots of thinkers these days are asserting that inanimate objects and other non-human entities have their own power and vitality independent from us. Sander’s exhibition provides evidence of this, in droves. Her various fruits and vegetables seem curiously powerful, and they rivet your attention. If one wants to find an art historical lineage for Sander’s work, I’d suggest not readymades and found objects but instead Edward Weston’s stunning black and white photographs of cabbages, peppers, and white radishes, and German Karl Blossfeldt’s pioneering close-up photographs of plant structures, in addition to the many still life paintings through the centuries. Both Weston and Blossfeldt focused on forms inherent in nature, which Blossfeldt termed, in the title of his 1928 monograph, Urformen der Kunst (Art Forms in Nature). Sander, however, has done something very different. Her works don’t involve images of nature, but instead natural objects on their own, presented in an entirely new, surprising, and thoroughly destabilizing way. You are enticed, but also confronted, by a cabbage. You are allured, but also staggered, by a dragon fruit which looks a bit like a dinosaur’s skin. Sander is hardly a fruit and vegetable artist. Her oeuvre includes a vast array of materials and contexts, and many of her artworks look decidedly different from each other. Early in her career she sanded and polished, by hand, a raw chicken egg making its surface sleek, sensual, and highly reflective (“Chicken Egg, Polished, Raw, Size 0,” 1994). It looks like it could be made of marble or glass — or perhaps a splendidly monochromatic version of a Fabergé egg — but it’s just an average chicken egg, purchased from a local store. Transformed by Sander, it became luminous and wondrous. For her 2011 exhibition at n.b.k. (Neue Berliner Kunstverein) in Berlin — which is, by the way, one of my all-time favorite shows — five circular holes were cut into the gallery’s second-story floor, the location of the Kunstverein’s offices, usually off limits to most visitors. The holes were located next to desks, where wastepaper baskets would normally be. For the duration of the exhibition, employees (including the gallery’s director) agreed to throw any unwanted mail, invitation cards, and other extraneous paper materials down the holes, where they slowly accumulated in the public spaces below in oddly riveting piles. Here, crumpled paper resembled whimsical origami and an abundance of white mixed randomly with flecks and bursts of vibrant color. Though accidental, the piles were thoroughly engaging sculptural forms. What unites many of Sander’s disparate works is the way she develops remarkable art out of otherwise unremarkable — to the point of completely mundane — non-art objects and situations, and that’s precisely what she’s done with Kitchen Pieces. Buying fruits and vegetables at, say, Chelsea Market or Whole Foods and bringing them home is an entirely normal part of life. Installing them on the walls of a gallery, and affording enthralled viewers the opportunity to scrutinize them, is entirely abnormal, and then there is the issue of decay. When I returned a month or so after the opening, the exhibition had changed, and it continues to change all the time. You could see slight stains on the wall where juices had leached out; the banana was browner, the mushroom more shriveled, the lettuce wrinkled and soft, and the tight green husk of an ear of corn had dried and peeled away in multiple directions. Other objects looked fresh; probably these were ones that had been replaced. Entropy is part of the show, the wear and tear of the world, but so too are regeneration and renewal. Karin Sander’s exhibition is really smart and daring. It is also a total delight. 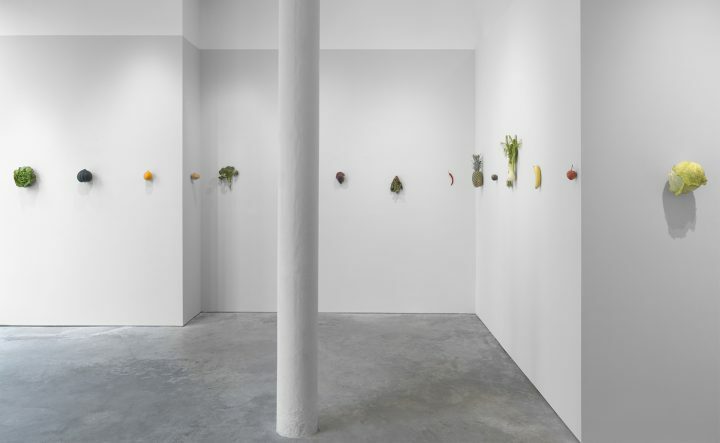 Karin Sander: Kitchen Pieces continues at Carolina Nitsch Project Room (534 West 22nd Street, Chelsea, Manhattan) through April 28.